Dampers & Variable Inlet Vane assemblies: Robust in design and manually or mechanically actuated to accurately control fan performance. 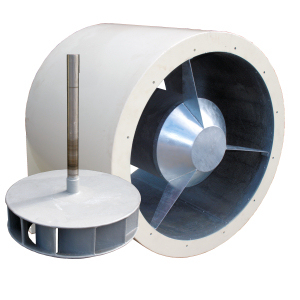 Noise Attenuators: Designed to reduce noise on fan inlet or discharge where specific noise criteria must be met. Anti-Vibration Mounts & Flexible Connections: Spring or rubber-in-shear mounts. Selected to minimise vibration transmission to structures and ducts. Casing lagging and cladding: For acoustic and high temperature applications. Mesh safety guards: Inlet and discharge guards where no ducting is connected. Inlet Box: Designed to replace performance reducing elbows on fan inlets. Evase': Specifically designed to reduce velocity on the fan discharge, thus improving performance. Shaft Seals: Rubbing type or mechanical, tailored for individual applications whether it be for noise reduction or gas containment. Anti-Spark Construction: Where increased safety is required for explosive / flammable gasses or dust. Split Casings: For ease of maintenance / impeller and shaft removal. Air Filters: Where the air supplied to an application must be 'clean'. All Aerovent Australia fan accessories are attributed the extensive care in design and manufacture that is synonymous with the Aerovent Australia name and that you, our clients, are accustomed to and entitled to expect.